In preparation for the busy summer harvest season, fruit distributors find tremendous value in equipment improvements and workflow efficiency. 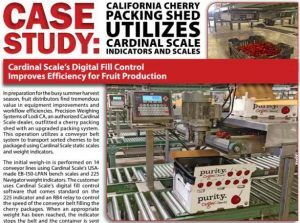 Recently, an authorized Cardinal Scale dealer outfitted a cherry packing shed in California with an upgraded packing system. This operation utilizes a conveyor belt system to transport sorted cherries to be packaged using Cardinal Scale static scales and weight indicators. The initial weigh-in is performed on 14 conveyor lines using Cardinal Scale’s USA-made EB-150-LPAN bench scales and 225 Navigator weight indicators. The customer uses Cardinal Scale’s digital fill control software that comes standard on the 225 indicator and an RB4 relay to control the speed of the conveyor belt filling the cherry packages. When an appropriate weight has been reached, the indicator stops the belt and the container is sent down conveyor rollers to the next work station. The operator is not required to press any keys to continue filling the next container. The filled cherry container then goes down the conveyor line to the checkweigher, comprised of a Cardinal Scale EB-150-LPAN bench scale with 190 Storm wash down indicator. This station utilizes the ColorZONE feature on the 190 indicator to rapidly indicate over, under, or desirable weight. The 190’s ColorZONE feature overcomes any language barrier that might be an obstacle with reading the indicator. The container is brought to the appropriate weight by manually adding cherries and then sent to final packaging. The Cardinal Scale system has improved the operation by automating the initial packing process with fill control software. The cherry packing process has become more productive and the packing shed is ready for the summer produce season. You can read the entire case study here. If this sounds like something you would be interested in for your business, then give us a call at (919) 776-7737 or fill out our Request for Quote link on our website, centralcarolinascale.com — we are an authorized Cardinal Scale dealer and would be happy to provide you with the right equipment for your weighing needs.